We’re seeing exciting progress on the Phase 2 remodel of a mid-century Seattle rambler! Phase 1 involved minor main floor plan and finish updates to create better entry flow and street appeal. The Phase 2 goal is to expand the house for the owners’ growing family and allow for a more private master suite. 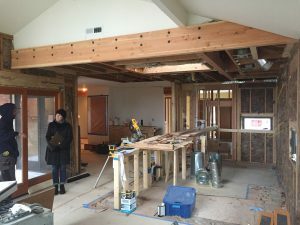 After considering a new second story addition option, we instead landed on expanding the daylight basement in order to keep with the Mid-Century massing and scale of the house and provide them with just the space they needed: no more, no less. The new master bedroom suite sits under an existing family room and upper deck that floated over the rear yard. The bedroom looks out onto a newly created rear courtyard, with a glorious, old red-leaf Japanese Maple in its center that is the focal point of the entire house. 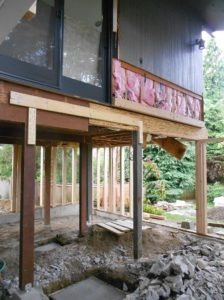 The challenge in this project has been to open the house up to the outside, connecting indoors to out, and the upper street level to lower level and rear yard. Opening up the living room using a big folding door to a new deck and stair down to the courtyard has done wonders to create a feeling of connection on both levels. We opted to move the outdoor stair down to the yard to the north side of the house via a catwalk to better engage with the Maple tree and add a boundary to the new courtyard below. The front yard has also been redesigned as a semi-public patio space, becoming a contemporary version of a front porch (see more about our idea of an outdoor “room” here). This is a very friendly neighborhood, and the owners specifically wanted to create meeting and gathering space at the street-side. Architectural fixtures and finishes all have been selected to enhance the Mid-century Modern aesthetic of this home: open and clean kitchen & bath spaces, some fun hex tiles in the bathrooms, and Northwest fir trim throughout to add a bit of warmth to the palette overall. We’ll be posting another blog with pictures of the finished project in the next couple of weeks! 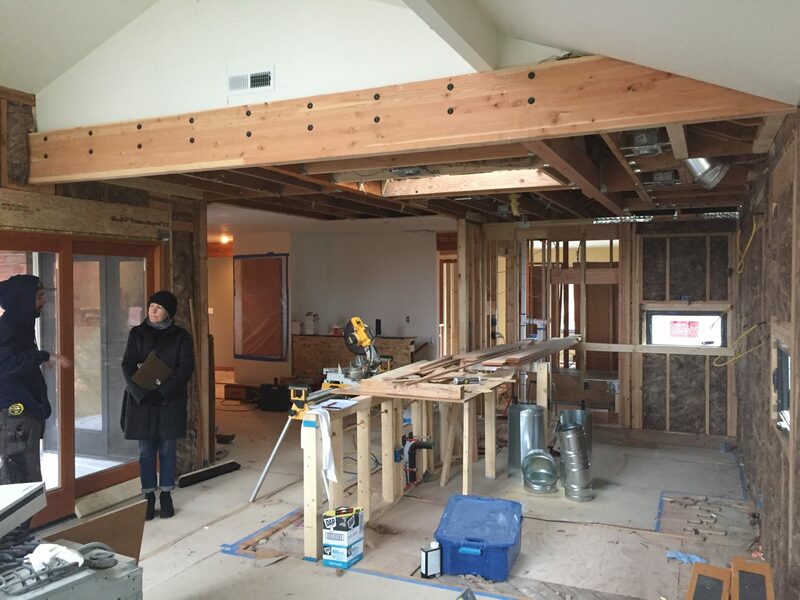 At right, see the framing and concrete work going in for the new addition under the existing family room. 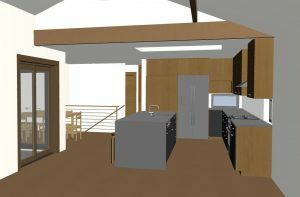 Below, see the 3D rendering of the new open island and kitchen, and then the kitchen under construction from the family room. A huge shout-out to our contractor on this project: Mark Boyns of True North Construction has been a real pleasure to work with and we hope to be on a team with him again soon. Stay tuned for finished pictures of our latest Mid Century Modern remodel, coming soon!